I love brightly colored fruit. It takes what I already think is super fun and just multiplies it times a billion. Plus I’m a sucker for star patterns in fruit, so I was ecstatic when Specialty Produce let me know they had gotten a few of these in stock. Star apples, or caimitos are also related to the mamey sapote, which I tried for the first time last week and enjoyed. This group of tropicals must be coming in to season as we start spring. Yay! Because the wait for all the summer fruit is basically killing me. 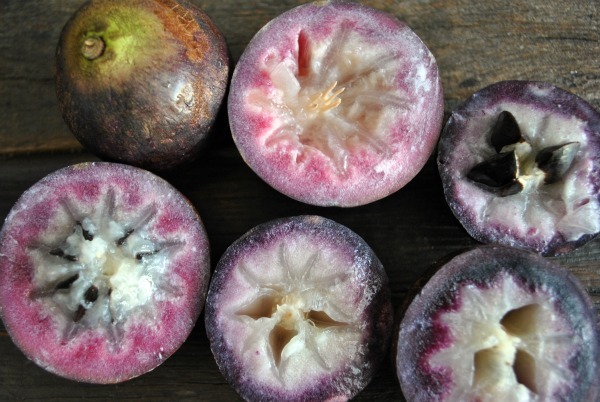 Unfortunately, the star apple was all promise and no pizzazz. It was horribly difficult to cut in any pleasing way. I could not for the life of me get that star to look great. And it’s covered in a light bit of latex, which tastes bitter and will coat your mouth in an awful way. When you try this fruit, be sure to rinse the fruit even after cutting. I have a history with latex and jackfruit, so I was relieved that my fingers didn’t stick together this time–but still a pain. 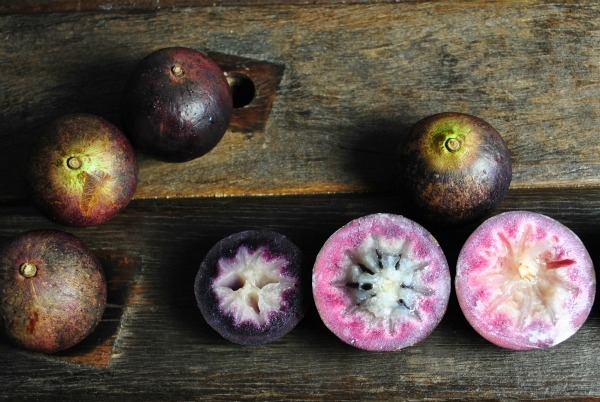 All in all, this is a super fun fruit for showing your friends and seeking out if you are a fruit adventurer, like me (and you)? But the flavor was mediocre at best. I’d reach for a longan, lychee, rambutan or even a grape way before a star apple. Slightly bigger than a golf ball. Purple, rust and green skin. Fuschia to deep purple flesh with a white center and black seeds that form a star pattern. Sweet, herbal and faintly tropical. Chewy, gelatinous and slightly fibrous. 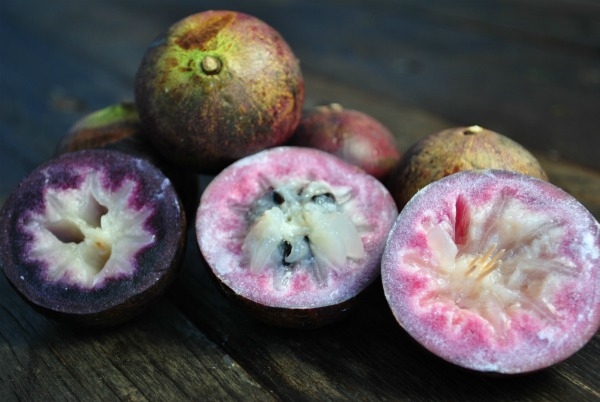 Not dense and luscious like the best longans, lychees and rambutans. Similar in texture to a peeled grape. I scooped the flesh easily with a spoon. Slightly sweet and a bit herbal – dangling right on the edge of bitter. Some bites reminiscent of an apple, which I probably mainly think because the name of the fruit gives that away. Leaves a slight film in my mouth. 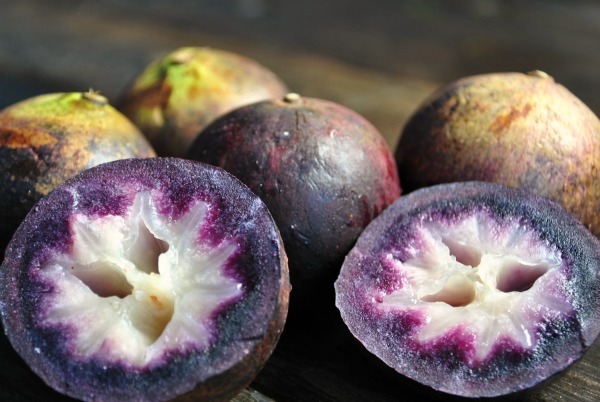 This is a cool looking fruit, with the range of purple and pink colors and the promise of a star pattern in the flesh. Plus it is unusual, which always wins points with me. But it has latex, was hard to cut in an appealing way, tricky to eat and wasn’t all that delightful. I can’t imagine going out of my way to get one of these again. Let me know if you’ve had one of these and loved it. Did I miss something?